Autumn is full of fun, color, and thanks, but did you know it can be full of recycling too? Make crafts with recycled materials this autumn, and you could end up with something as cute as the Adorable Jar Turkey Thanksgiving Craft. 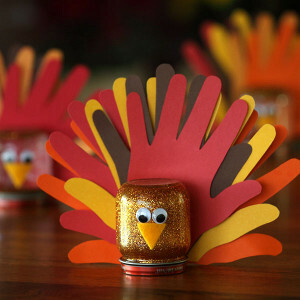 Thanksgiving crafts for kids are great ways to keep busy while Mom is cooking. Deck out your home with Thanksgiving craft ideas to make the most of fall. Use any old jars to make the most precious kids' Thanksgiving crafts out there, and your guests will be thankful that you're so artsy. 1. Place child’s hand on a piece of scrapbook or construction paper. Trace with a pencil and cut out. This will be your template. 2. Trace and cut out multiple handprints with template, alternating paper colors. Note: You will need 3 to 5 per globe. 3. Add a glue dot at the bottom of one handprint. Place another handprint on top but tilted slightly to the right. Continue process to create fanned out handprints that will be turkey feathers. Set aside. 4. Remove label from baby food jar and empty contents. 5. Wash and dry jars. 6. Place lid back on jar and place upside down on a flat surface. 7. Add glue dots to the back of jar. Place fanned out turkey feathers onto the back of the jar and gently press to secure to adhesive dots. 8. Press wiggle eyes onto glue dots on Tacky Dot Roll then peel off and press onto front of jar as shown. 9. Cut a small triangle out of yellow felt and place on jar just below eyes, adhering in place with glue dots. 10. Open jar and pour water inside. Sprinkle glitter inside. 11. Add Max Tacky Glue to the outside rim of the jar and seal with lid. Let dry completely. This project is featured in our FREE Thanksgiving eBook! 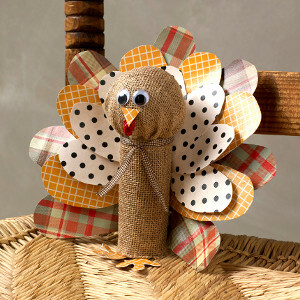 Click here to download a copy of 19 Thanksgiving Crafts for Kids!